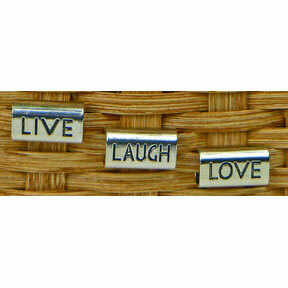 Live, Laugh, Love Bead Pkg. Beads & Buttons Live, Laugh, Love Bead Pkg. Approximate Size: 7/8"L x 1/2"T x 5/16" opening. Contains one of each Live, Laugh, Love bead/pkg. Can be woven onto your basket. Colors is a "Pewter" finish.